This is a very tasty side dish of potatoes. I am constantly trying different ways to cook and present this humble staple in our diet. As the Italians eat pasta and the Asians eat rice so the Irish love their spuds. It would not be unusual for the man of the house in this country, upon being presented with a tasty pasta dish for dinner, to say 'That was very nice but what happened to the spuds? Therefore the hunt is always on to find various methods of cooking other than plain boiling, mashing , roasting or chipping. This is one way which is quick, simple and tastes really good. 1 teasp of Old Bay Seasoning or any other spice you prefer or none. Place the cream, milk old bay seasoning, black pepper and garlic in a fairly large saucepan and bring to the boil. Remove from the heat and put the lid on to let the flavours infuse. Peel and slice the potatoes into approximately 1cm slices. Pop them into the saucepan with the milk and cream mixture and bring to the boil. Simmer gently until just cooked. About five minutes before the end of cooking scatter over the parmesan.. Allow to stand for a few minute before serving. This can be served with anything of course but I think it goes exceptionally well with baked or boiled gammon. It makes a meal of plain bacon or sausages and sits well with fish. I love such scrumptious Gratins! A wonderful recipe! Granny this looks like my definate idea of comfort food...yummy! Haha...my OH loves his spuds too, a meal is not complete without them. 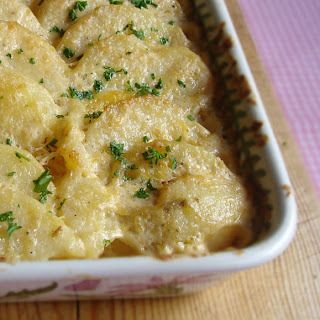 I love gratin, this one sounds really tasty. I must have inherited my love of spuds from my Irish grandfather. Just don't tell my Italian relatives!! This looks delicious. There is nothing better than a comforting dish of spuds. Yum! That looks good. There's nothing to beat a spud or two for dinner.